The new East River Parks are magnificent and welcome additions to the waterfront, a tony garland showcasing the shining shield wall of Manhattan, and a value adding loss leader for landlords to dazzle the prospective Tower People with. 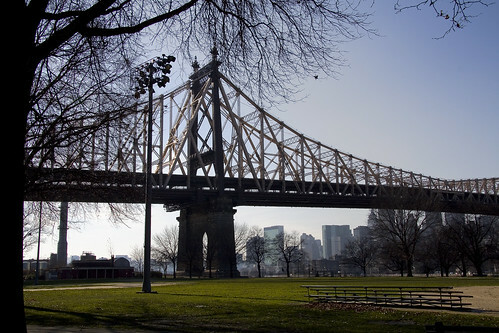 Queensbridge Park was similarly awe inspiring upon its completion in the 3rd incarnation of Ravenswood, until things went horribly wrong in the Housing Complex it was designed to serve and the vain optimists in City government lost interest in funding it. Today, its bulkheads are collapsing into the river and the muddy ball fields and patchy lawns are shoddy at best. Perhaps the experiences of the Tower People will be different as the calendar pages roll by, here in the Newtown Pentacle. 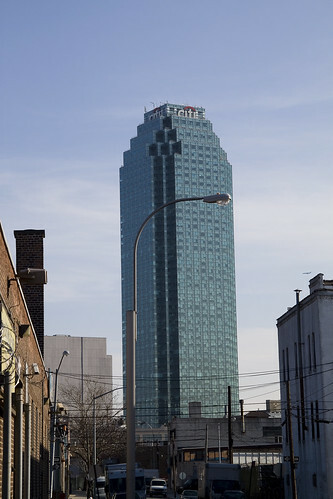 The story of Long Island City, as one proceeds south, is told in steel and concrete. Leave the modern world, which is possible in Long Island CIty, and see the apotheosis of victorian aspirations. 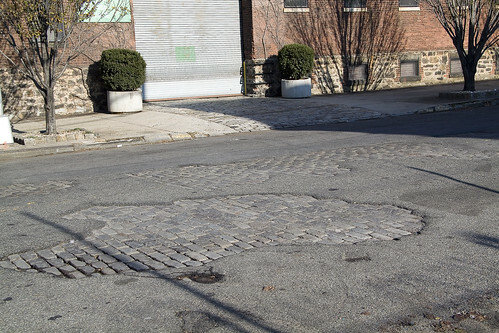 The industrial past of the 19th century, whose cracked pavement and toxic inheritances define the modern era, can be accessed merely by crossing the street. 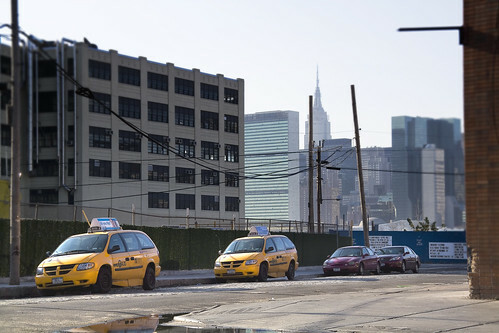 By 2020, the Manhattan Skyline will be hidden behind even more Tower Condos, and Hunters Point will accommodate some 5,000 new housing units. Hotels and Parks are also planned. All the while, the City is closing Queens Fire Houses and Hospitals. 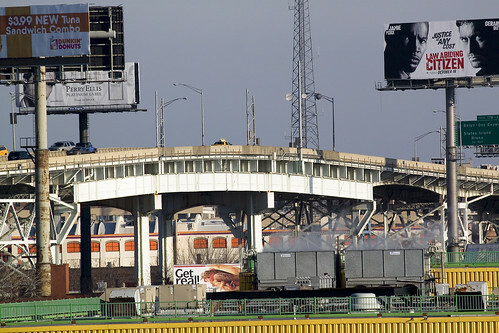 Surmount the Pulaski Bridge, but do not touch it with your bare skin. From here, the early and mid 20th century is visible. 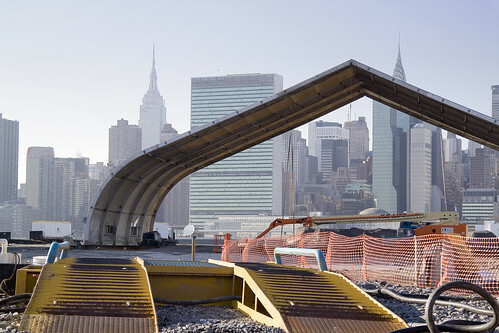 Witness a steel highway- Robert Moses’s LIE soaring over “the empty corridor“. It once carried the terrified middle class away from a troubled mid and late 20th century New York, in the manner of some open artery, creating the vast populations of suburban Long Island. 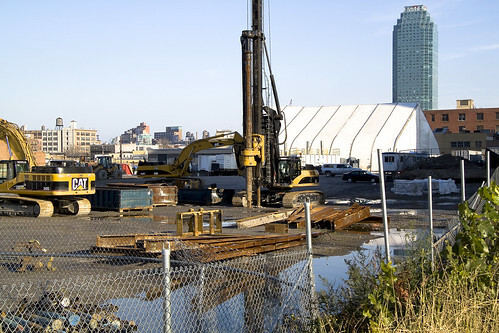 It also blighted and depopulated western Queens, turning the valuable industrial land it shadowed into empty warehouses and abandoned brick lots. 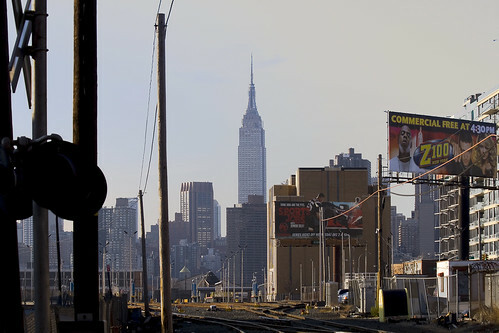 For the last half of the 20th century, Long Island City and the surrounding communities became ethnic ghettos and crime infested wards of municipal indifference. In this mid century midden, the rats ruled, and rat kings ruled over all. There is actually nothing funny about the Creek, its a sobering subject, but I do my best to keep things light. 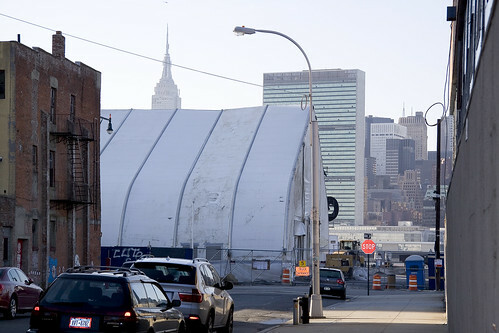 One of the maddening facts though, is that the open air warehouse observed above, is designated to become a City Park as the Hunters Point South phase of the Queenswest development gets rolling in 2010. 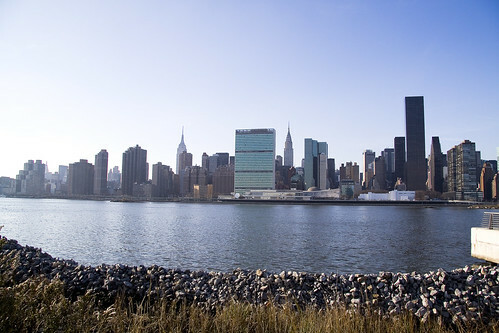 The EPA comment period on the issue of “superfunding the creek” has just ended, and as expected, the Oligarchs of Manhattan have rendered their opinion that the Creek should remain under their jurisdiction. Did you think, honestly, that City Hall is going to cede control over a 4 x1 mile strip of Brooklyn and Queens to Washington without a fight? 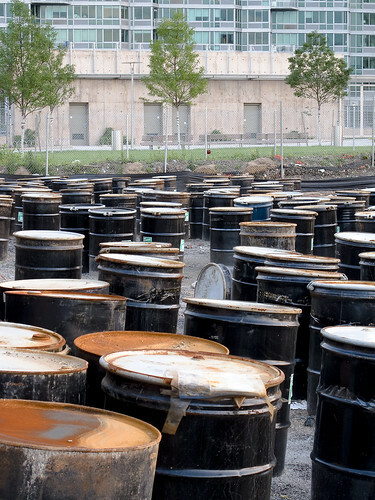 That’s what Superfund means, the feds TAKE OVER, for as long as it will take to clean up the mess. They will fine whoever they want to for whatever they want to, issue orders that MUST be followed by commoner and king alike, and will not take “NO” or “That isn’t possible in this climate” as an answer. 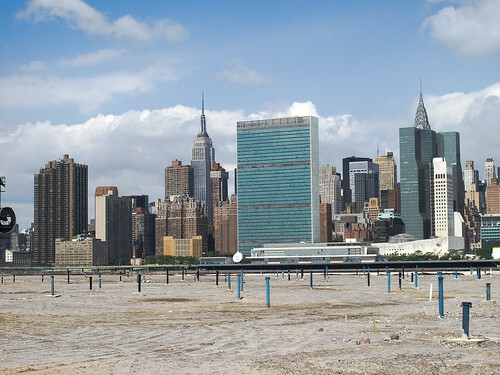 In the case of the Newtown Creek, the estimates for completion of project (at the medium estimate) are 30-45 years (45 years ago in 1963, John Kennedy had just been assassinated in November and LBJ was president). 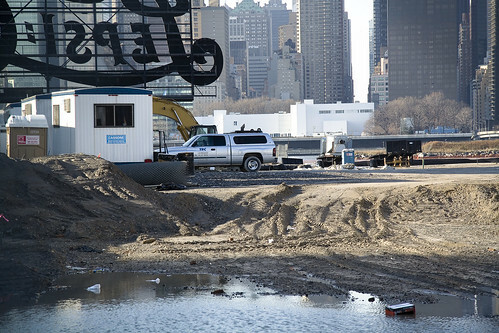 A river of federal money will flush out the Newtown Creek, but the tide is going to hit the masters across the river in Manhattan. Our fellow citizens in the Western States have been chaffing under the authority of the EPA for a long time, which has created an electoral preference for smaller and less intrusive government policy amongst the citizenry. A lack of “institutional memory”, a disturbing modern trend easily blamed on a 4th estate owned and operated by real estate interests, is a smoking volcano. It is the end of a year of change- but all years are “years of change”. New York, and the United States on the whole, continue their trend toward apathy and quasi-fascism. The burdens of the social contract suddenly seem to be too much to bear as the Baby Boomer population begins to retire. Ceasar is just a few years away now, and will choose to reveal him or her self shortly- and offer clarity and purpose to the masses- who will love their Ceasar, along with the bread and circuses. And all the poisons in the mud will leach out. Fearful that I’ve drifted too far into the prurient and macabre aspects of the Newtown Pentacle, haunted by notions that infected me at Calvary and Zion, my wanderings of late have been familiar and “safe” ones along well traveled streets. Of course, with the arrival of winter, I have been burdened by the many layers of insulation my frail physique commands. 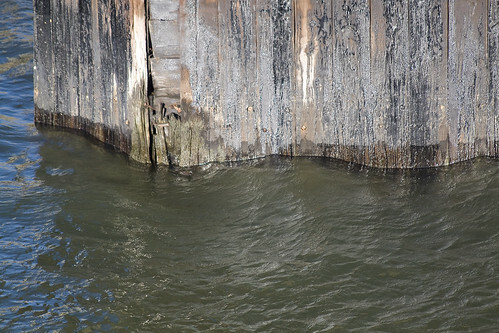 Simple coastal walks, through the soot choked brutalities of northwestern Queens, along the East River. Above, Queensboro thunders away , thrumming out ultrasonic scalar waves in the manner of some vast steel cello, with its eternal vehicle and subway traffic a bow etching against concretized fret boards. Through the mist appears the shield wall of Manhattan. 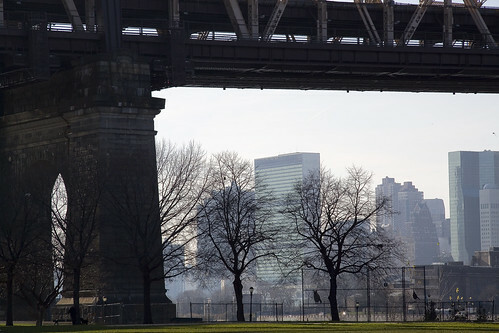 Everything in Queens looks toward Manhattan. Ravenswood, as it was and is known, once was home to mansions and in the early 19th century- luxury yachts docked at its private piers. The noveau riche who lived here were captains of local industry in Long Island City (which at the time was a series of individual villages) whose bellies had become swollen by the profits found in exploiting a thriving, natural, and wholesome body of water called the Newtown Creek. 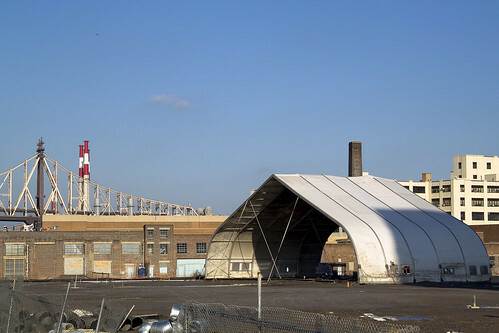 Further south, beyond the cacophony of Queensboro and its harmonic influences, the last remnant of Ravenswood’s second incarnation as manufacturing center lies in ruin. After the millionaires, and after a period of their former estates being used as asylums and charity hospitals, came the factories. Unclean, 19th century industry’s only regulation and obligation was to profit. Municipal corruption and indifference to the environment allowed this second iteration of Ravenswood to pollute unbound by sense or statute. When the 2nd Ravenswood went the way of all flesh, in the early-mid 20th century, the politicians and the banks were waiting. 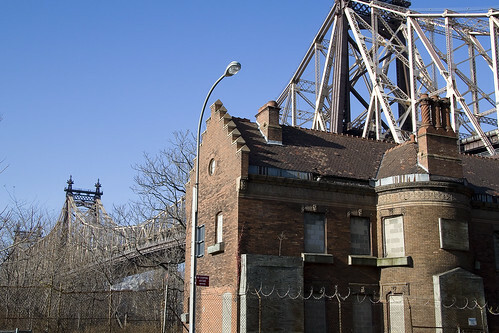 The city planners and their cabal of banking interests grabbed what they could by eminent domain and by condemning entire neighborhoods in the name of “urban renewal“, creating “the welfare state” and the Queensbridge Houses, along with thousands of similar “complexes” of public housing which rewrote the map of entire boroughs and even distant satellite cities. The blighting effect of siting these massive silos of poverty on the surrounding communities- however- manifesting the radical crypto fascist architectural theories of LeCorbusier– was an unintended consequence. The third incarnation of Ravenswood. When the Megalith was erected, a watchtower for some unholy thing that neither breathes nor lives yet hungers, it signaled the beginning of the Fourth World of Ravenswood. 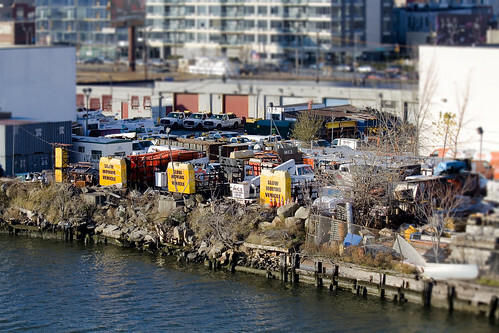 Manufacturing, which somehow survived the 20th century in Long Island City, does not fit the residential and financial business model of this 4th world. Ravenswood will be a gallery of towers, splendid and shining, facing toward the center- toward Manhattan. This corporate version of Ravenswood, the ultimate dream of LeCorbusier. 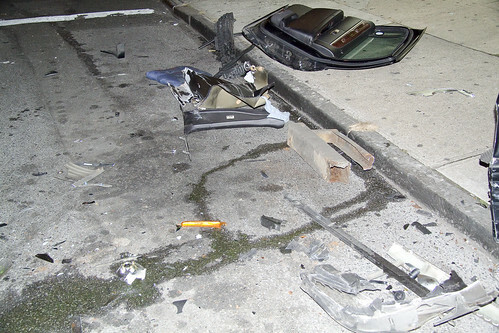 Came across this dire tableau the other night (December 16th to be exact) here in the oft perplexing grid of Astoria’s streets. 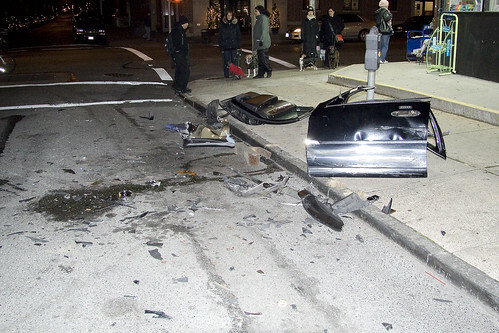 At the corner of 44th and Broadway, it seemed that some great hand had reached down and jerked a car skyward, violently. 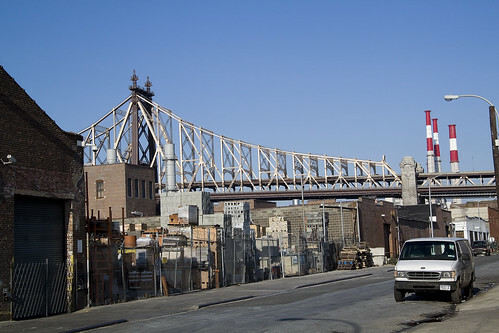 Astoria is a neighborhood in the northwestern corner of the borough of Queens in New York City. 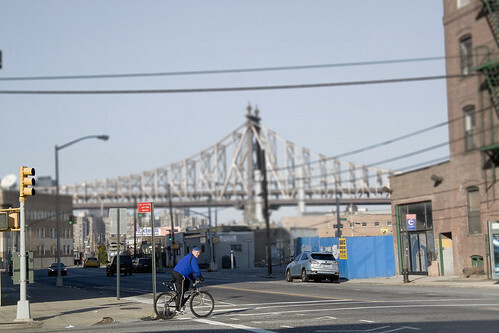 Located in Community Board 1, Astoria is bounded by the East River and is adjacent to three other Queens neighborhoods: Long Island City, Sunnyside (bordering at Northern Boulevard), and Woodside (bordering at 50th Street). 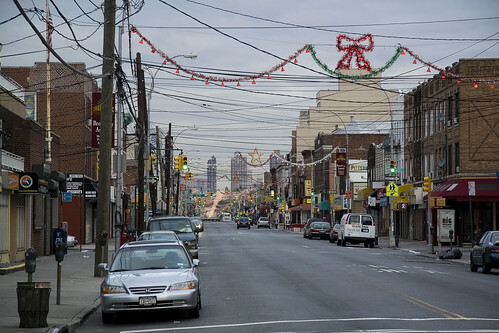 Astoria Heights, more commonly referred to as “Upper Ditmars,” borders Astoria on the northeast, at Hazen Street. The eternal entrepreneur who owns the bodega establishment on the corner informs me- as his fruitstand and delicatessen has a full video surveillance coverage of the corner- that a “black car” or “car service” driver was parked in the spot when a delivery truck rounded the corner at many times the speed limit. All right, I’ll admit it- the last couple of posts about ChristmAstoria have painted the seasonal holiday in a somewhat sarcastic veneer. I grew up Jewish and have always been a little jealous of a holiday with such a rich mythology. Channukah, like Christmas, is all about celebrating “having survived the Romans”, but the Christmas iconography is just so much more compelling. There are also NO Rankin-Bass stop motion Channukah cartoons, and Heat Miser would have to be rethought entirely. The Winter Warlock, however, ports directly over – from an interfaith perspective. Your humble narrator and the extensive staff here at Newtown Pentacle HQ (its a bit like TMZ around here- swimming pools and movie stars) just wanted to say thanks for following us around and checking in at the blog periodically, as well as wishing you all a healthy and happy holiday. The plan around here is to have one last feast day (or two) and get back to work. I’ll be wandering around the empty streets this weekend whenever I get a break- weather and feast wise. 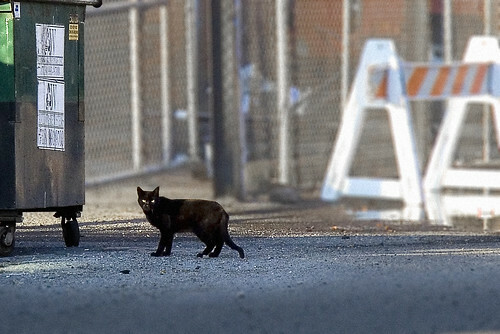 Look for a crazy looking old man in a filthy black raincoat taking pictures of dead rats- that’ll be me. 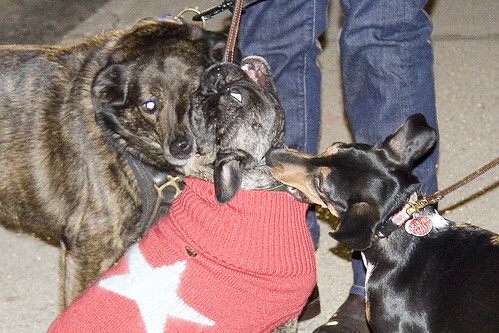 My little dog, Zuzu (left), has extensive obligations all weekend as well, I am told. I’ll be taking a day or two off, but will most likely get rolling again on Saturday. Have a merry christmas, or at least a couple of days you don’t have to go to work. Let me preface today’s post by mentioning that the anagrammatic transposition of Santa and Satan is no accident. Given the macabre sense of humor that the most high god itself is suggested to have by scripture- making its arch enemy transmogrify into a nice old man who gives presents to children- on its birthday- is exactly the sort of thing one would expect from the sun god of a desert people. If you think about it, Santa is principally red in color and flies about with a wild hunt of magickal herd animals. He is also invulnerable to chimney fires and possessed of a menacing laugh. 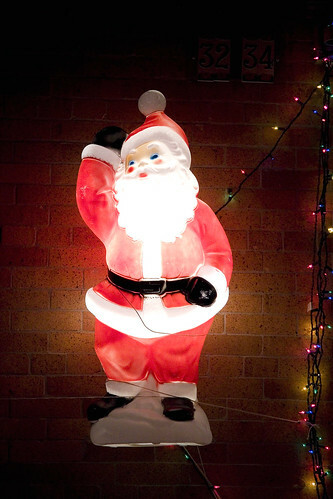 Ergo- Santa Claus (saint nick) might actually be Satan (old nick). This link will be handy on Christmas eve, as the Strategic Air Command’s NORAD will be tracking the demon as it makes its way south from the polar wastelands toward the Newtown Pentacle. Numerous parallels have been drawn between Santa Claus and the figure of Odin, a major god amongst the Germanic peoples prior to their Christianization. 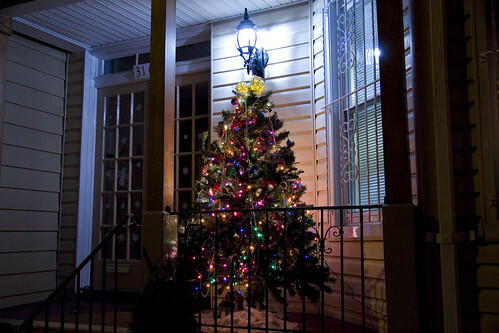 Since many of these elements are unrelated to Christianity, there are theories regarding the pagan origins of various customs of the holiday stemming from areas where the Germanic peoples were Christianized and retained elements of their indigenous traditions, surviving in various forms into modern depictions of Santa Claus. In the early days of the American Colonies, which modern politics and propaganda instruct its citizenry to believe was a time of “freedom and liberty”, personal or non standard expressions of religion were frowned upon. Of course, that was up north in New England. 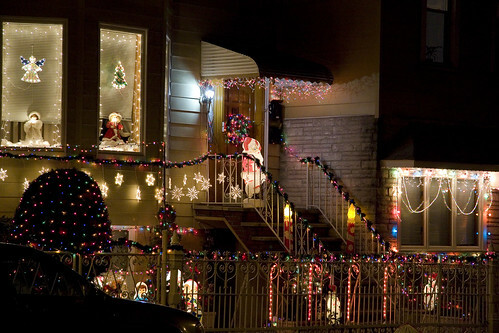 New York City and its citizens are actually the authors of the modern Christmas. Thomas Nast created the visuals in 1863 for “Harper’s Weekly”, Washington Irving turned Sinterklaas into Santa Claus in 1809’s “A History of New York” and also inserted the reindeer and sleigh, Clement Clarke Moore (whose family got their start in colonial Newtown) is said to have written “Twas the night before Christmas” in 1823, and the NY Sun published the famous “Yes Virginia, there is a Santa Claus” in 1897. Christmas celebrations in Puritan New England (1620-1850?) were culturally and legally suppressed and thus, virtually non-existent. The Puritan community found no Scriptural justification for celebrating Christmas, and associated such celebrations with paganism and idolatry. The earliest years of the Plymouth colony were troubled with non-Puritans attempting to make merry, and Governor William Bradford was forced to reprimand offenders. English laws suppressing the holiday were enacted in the Interregnum, but repealed late in the 17th century. However, the Puritan view of Christmas and its celebration had gained cultural ascendancy in New England, and Christmas celebrations continued to be discouraged despite being legal. When Christmas became a Federal holiday in 1870, the Puritan view was relaxed and late nineteenth century Americans fashioned the day into the Christmas of commercialism, liberal spirituality, and nostalgia that most Americans recognize today. In modern times, the garish lighting adorning Astoria is also equipped with tiny electronic speakers which blare endless loops of the first movement of “Jingle Bells”. Were one prone to paranoid and conspiratorial thinking, it would seem that some vast cabal of industrial and economic powers have convinced the citizenry of these United States to consume electricity unabashedly. 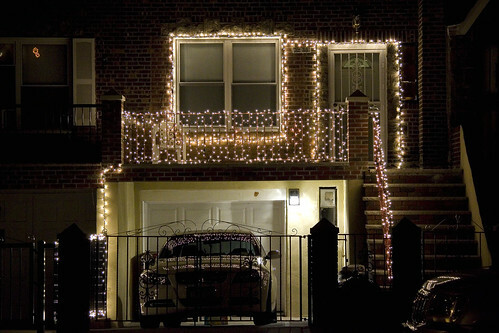 Such thinking is faulty, however, as the tradition of christmas lights is far older than the nation- isn’t it? Just to ensure that the Newtown Pentacle doesn’t accidentally cause a remonstrance to spring up, we need to give equal time to all faiths in these ChristmAstoria posts- thus- December 23 is the date on which a surprisingly large number of Americans will celebrate Festivus. Watch out for feats of strength being performed, and gather round the Aluminum pole, its time for the airing of grievances. 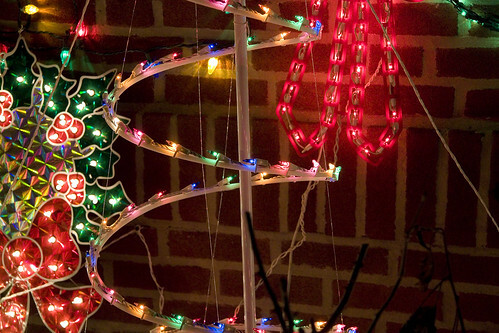 The practice of putting up special decorations at Christmas has a long history. 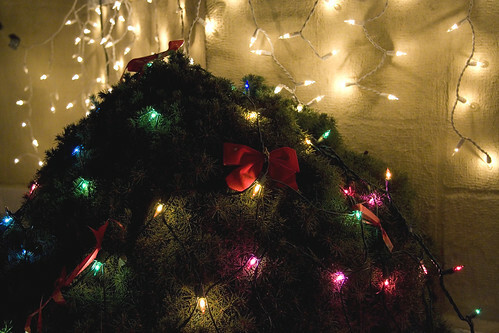 From pre-Christian times, people in the Roman Empire brought branches from evergreen plants indoors in the winter. Christian people incorporated such customs in their developing practices. In the fifteenth century, it was recorded that in London, it was the custom at Christmas for every house and all the parish churches to be “decked with holm, ivy, bays, and whatsoever the season of the year afforded to be green”. The heart-shaped leaves of ivy were said to symbolise the coming to earth of Jesus, while holly was seen as protection against pagans and witches, its thorns and red berries held to represent the Crown of Thorns worn by Jesus at the crucifixion and the blood he shed. 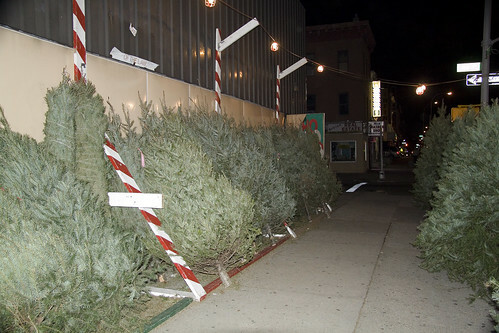 The annual occurrence of Christmas adorns the tired streets of ice struck Astoria with electrical garlands of questionable taste, speakers blare seasonally appropriate melodies from their lamp post perches, and vast hordes of shoppers seek to acquire, transport, and then dispense a bounty of trade goods. Such peculiar behavior garners no small amount of comment from the large middle eastern and southeast Asian communities within the ancient village, who are not willing to miss out on what seems to be a lot of fun, and they eventually join in and play along with the odd custom. Nobody ever stopped him in the street to say with gladsome looks “My dear Scrooge, how are you? When will you come to see me?”. No beggars implored him to bestow a trifle, no children asked him what it was o’clock, no man or woman ever once in all his life inquired the way to such and such a place, of Scrooge. Even the blind men’s dogs appeared to know him; and when they saw him coming on, would tug their owners into doorways and up courts; and then would wag their tails as though they said “No eye at all is better than an evil eye, dark master!”. 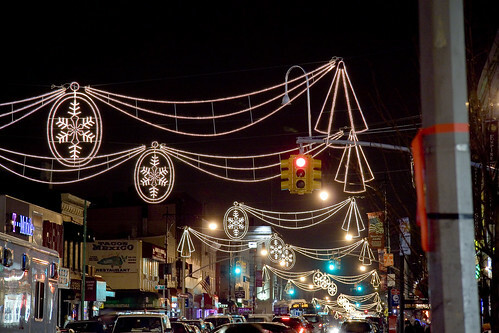 Amongst the tangled thickets of cable TV, telephone, and emergency power supply cables (still in place some 3 1/2 years after the Great Astoria Blackout), one might observe the extensive holiday decorations installed by the local Business Improvement District Council and Municipal authorities. On Steinway Street, in particular, an oppressive bleating of holiday music is inescapable, and endless loops of holiday songs considered to be inoffensive and nonsectarian drone cheerily on. They do not play “Onward, Christian Soldiers” for instance. Ebenezer Scrooge is the principal character in Charles Dickens’ 1843 novel, A Christmas Carol. At the beginning of the novel, Scrooge is a cold-hearted, tight fisted and greedy man, who despises Christmas and all things which engender happiness. A quote from the book reads “The cold within him froze his old features, nipped his pointed nose, made his eyes red, his thin lips blue, and he spoke out shrewdly in his grating voice …” His last name has come into the English language as a byword for miserliness and misanthropy, traits displayed by Scrooge in the exaggerated manner for which Dickens is well-known. The tale of his redemption by the three Ghosts of Christmas (Ghost of Christmas Past, Ghost of Christmas Present, and Ghost of Christmas Yet to Come) has become a defining tale of the Christmas holiday. Scrooge’s catchphrase, “Bah, humbug!” is often used to express disgust with many of the modern Christmas traditions. 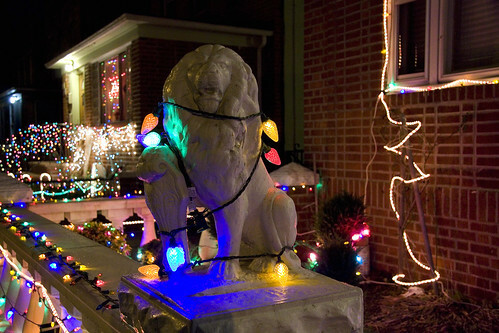 To appreciate ChristmAstoria, however, one must visit its fertile climes at night. 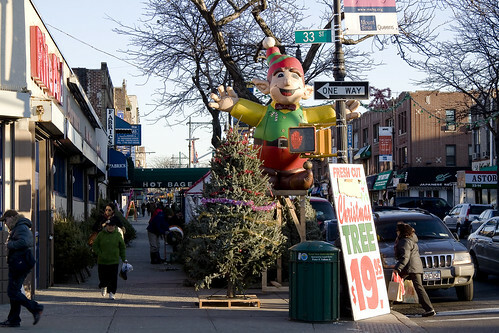 Ever conscious of social status and standing, given to vulgar displays of tasteless consumption and wild imaginings on the subject of real estate development, the population of Astoria does not disappoint when competing with neighbors for the attentions of holiday tourists. Even the police cameras and red light robotics clustered around the corner of Broadway and Steinway Street look positively resplendent when illuminated by such redolent regalia. So let’s be fair to Scrooge. He had his faults, but he wasn’t unfair to anyone. The free market wouldn’t allow Scrooge to exploit poor Bob… The fact that Bob Cratchit could read and write made him a very valuable clerk and as a result of that he was paid 10 shillings a week.” Factually Bob’s wage according to Dickens was fifteen shillings a week not ten shillings ( Bob had but fifteen bob a-week himself; he pocketed on Saturdays but fifteen copies of his Christian name; and yet the Ghost of Christmas Present blessed his four-roomed house ) but the thrust of Meese’s argument was that the ‘free market’, better known to economic theorists as laissez-faire , served Bob well and had provided him with a living wage to feed his family. Ed Meese omitted to say that the free market economy in England in the 1840’s, a period that became known as the ‘Hungry Forties’, was in deep depression and an excess of labour was keeping wages low. Cratchit could hardly ask for more when there were many willing to take his place and for probably for much less. also, just as a note: This is the anniversary of the Lincoln Tunnel opening for business in 1937.